Please use the page tabs at the bottom to flick between Divisions. Round 1 standings are up! Round 2 results are up! Any scores shown in RED are the result of a penalty being applied. This score cannot be used as a drop score so will count in the final standings. The lowest 6 scores will be dropped from your total with the exception of the scores in RED. See the Penaltys applied for Round 2, Hockenhiem Short HERE. Round 3 standings for Snetterton 200 are up! Round 4 Standings are UP! 3 dropped races have been applied to everyone scores. So your worst 3 scores have been taken away! So its looking close for all champioships with DSRL aidtheace leading the Division 1 championship followed by EpilepticToast, DSRL Drift, EP3 MURPHY and tha Sup3rNova all close behind. In the Teams Championship for Division 1 there is only 1 point separating Ginetta Racing and Nodrito Racing with drops applied! In Division 2, iiDelinquenTii leads at the top by 1 point from D4NINHO. With B1200 in 3rd followed by Hurt MaGurt in 4th and DSRL Mcduff in 5th. In the Division 2 Teams Championship, DelinqMundo Racing have taken the lead ahead of T3 Racing and GRR Racing now that drop scores have been applied. See you all at Round 5 at Watkins Glen Short in 3 weeks time! standings says next up is leguna seca but calendar says dubai? Cheers dan, I'll shall get that sorted. What happened with the results for div 2? Sorry B1200. We are having some technical difficulties with our sheets. Results now up for Div 2, Sorry for the delay! So, That's the end of The DSRL Ginetta Junior Championship! Thanks to all that took part! DSRL aidtheace took the title in Division 1 ahead of micko39 and FAF Stoned Stig. In the Division 1 Teams battle, Ginetta Motorsport took the honours in front of Bielik Racing and Nodrito Racing. In Division 2, iiDelinquenTii took the title with D4NINHO a close 2nd with only 5 points between them at the line! With B1200 taking 3rd overall! In the teams battle, DelinqMundo Racing took the title ahead of a close T3 Racing and GRR Racing. Well done to all drivers that took part and we hope you will be back for more, Thanks for making the DSRL what it is! 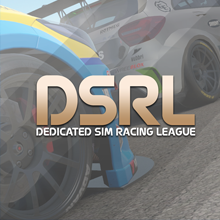 The Dedicated Sim Racing League!